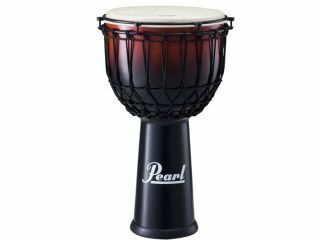 PRESS RELEASE: Pearl's EZ Tune Djembe is the first djembe ever to combine the traditional look and feel of a rope djembe with the modern functionality of a mechanical tuning system. Available in 12.5" or 14" sizes, and with traditional oak or lightweight fiberglass construction, the EZ-Tune Djembe provides the incredible low-end response and cutting high-end projection that Pearl djembes are known for, with unprecedented tuning accuracy. EZ Tune Djembes truly are the future of Djembe construction and function.